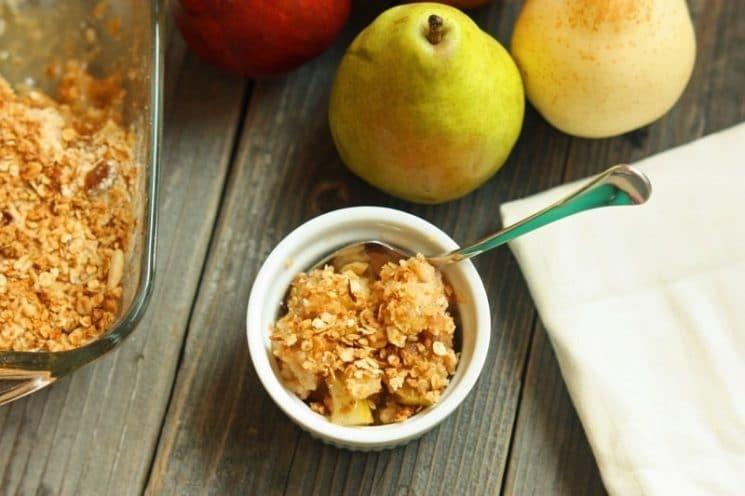 Pears are a naturally sweet fruit and so it only makes sense that they would make a delicious dessert. We love pears because they are delicious, portable, make great baby food, and are naturally high in fiber! Pears have more fiber than pretty much any other fruit. Just to give you an idea of how much fiber they have, we made this fiber chart. Wow! 5.5 grams for one pear. 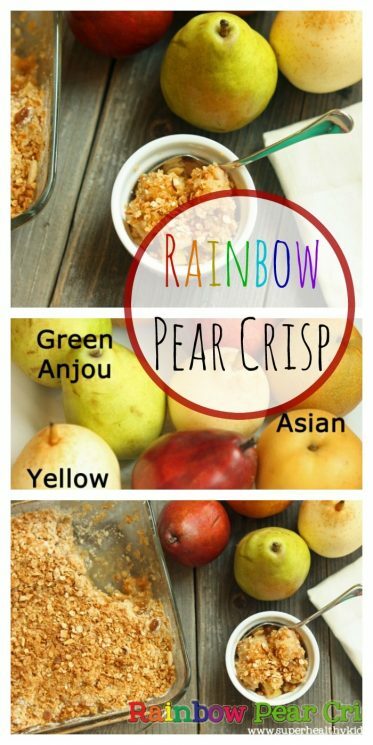 There are so many varieties of pears, each one providing a little different flavor and texture. We bought 5 different varieties to try. Bosc pears are taller than other pears with its elongated slender neck. Its brown skin has a relatively rough texture and can have hints of yellow or green. The pear’s white flesh is sweet, crisp, and firm to the touch. If a recipe calls for poaching, Bosc pears are a good choice since they will keep their shape and not turn to mush. They’re also good for eating raw and baking. Both yellow and red bartlett pears have a delicate thin skin, a sweet taste, and a bite that’s juicy and soft. 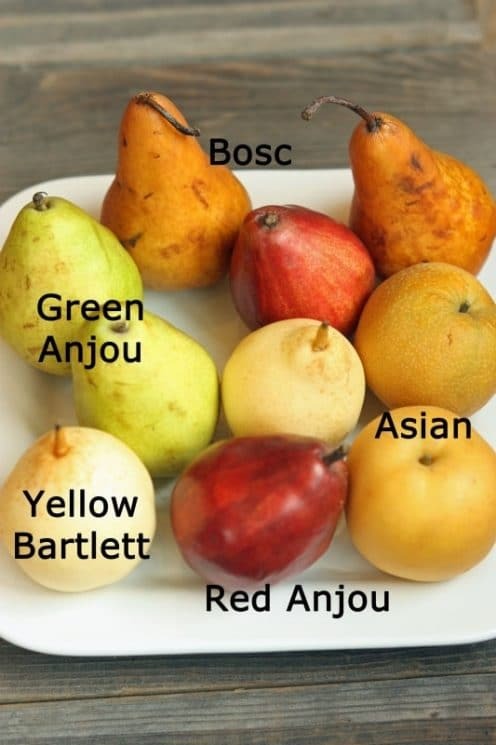 Bartletts used to make up most of America’s pear production (they have since given way to Anjou and Boscs), and they are still the most popular variety in the country. Most canned and processed pears (purées, juices) are made from Bartletts. Bartlett’s are good for baking. Of the two types of Anjou pears, the green is easier to find, although red Anjous are gaining ground. Short, squat, and very plump, these pears look as if they almost have no neck—giving them an egglike appearance. Both varieties have a smooth skin with flesh that’s juicy and firm. Green Anjous stay green, even when fully ripened. These are best eaten raw. This apple-shaped pear is different than most other pears. It has a round shape, the skin’s texture is a little gritty and not as soft as that of other pears, and the flavor isn’t the typical pear flavor. The Asian pear is ripe when it’s firm, not when it becomes more pliable to the touch. These are delicious eaten raw, in salads, and slaws. We are really big on providing a variety of flavors and textures with different fruits and veggies, and so we created this crisp with 5 varieties of pears to give color, flavor and texture variety to your littles. Some of the pears are sweeter and softer, while others have a slight crunch and more tartness. 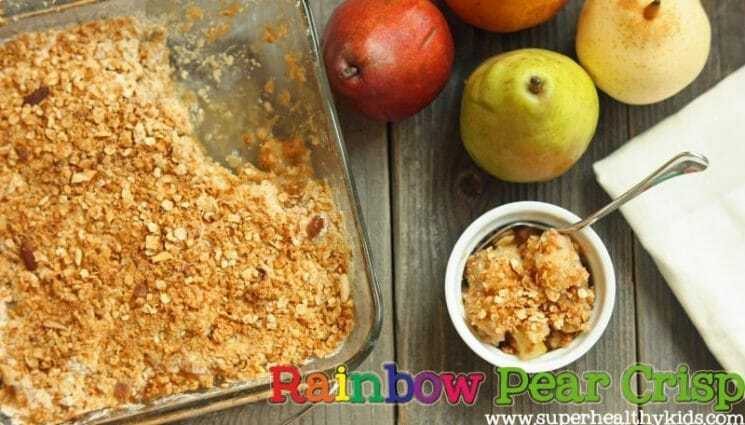 It is a perfect combination for a delicious dessert packed full of fiber. The variety of pears available will depend on where you live, and the season. We used Bosc, Red Anjou, Green Anjou, Asian, and Yellow Bartlett. Step 2: Slice pears in half, and scoop out the middle. Step 3: Sprinkle sliced pears with lemon juice. 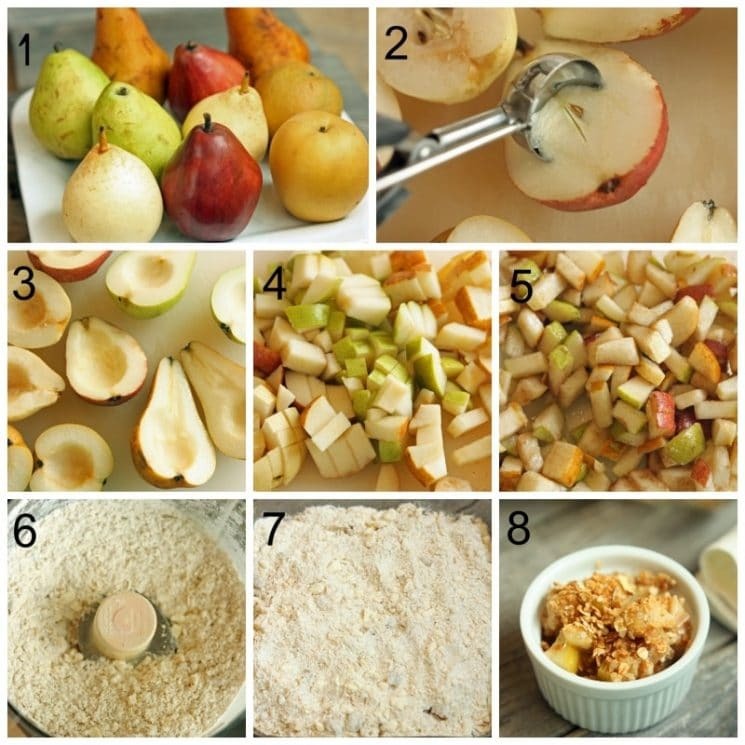 Step 4: Chops pears into bite size pieces. Step 5: Toss with cinnamon and sugar. Step 6: Pulse crumb ingredients in a food processor. 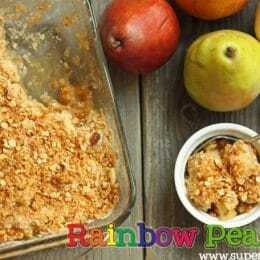 Step 7: Sprinkle crumb mixture on pears and bake. Serve it warm with fresh whipped cream, or vanilla yogurt. Peel, core, and chop pears. Place in a 8×8 baking dish and sprinkle with lemon juice, sugar and cinnamon. Pour apple juice over pears. Gently toss. In a food processor, combine flour, oats, brown sugar, and cinnamon, salt and cold butter. Pulse until combined.